Upon returning from last month’s ACRL 2013 conference, I was excited to sit down and explore Hugin after more than one librarian mentioned using it to create panoramic and/or 360-degree images (for one example, see this PDF of Scott Rice and Margaret Gregor’s Presentation “This Library Orientation is Fun! Building a Successful Virtual Experience for Students”). 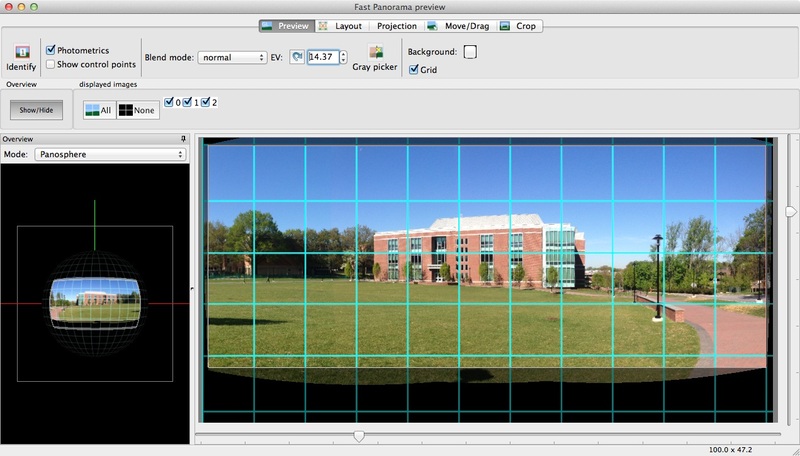 Based on the Panorama Tools project, Hugin is a free, cross-platform photo stitcher that allows you to join overlapping images into a single panoramic image. Although Hugin’s advanced features can be initially overwhelming for the casual user, with seemingly endless image manipulation tools, the “Assistant” tab can get you started creating panoramas in just three quick steps. After downloading Hugin, the first step in the assistant is to load your images. I decided to test out Hugin using images of the Towson University campus I snapped with my phone’s camera. Hugin will attempt to automatically detect information about the lens used to take the images, and it easily recognized the information for my iPhone’s camera. The next step is to “Align” the images. Hugin automatically attempts to create a single panoramic image from the images you upload – including selecting “control points” between images (significant overlapping points in each photo used to align the images). From there, you can also adjust a number of other settings, including layout, projection, and cropping. Finally, you can “Create your panorama.” The Hugin processor will ask you to save your project (which means you can come back to work with it again later) and will produce your panoramic image. (Tip: It look me a while to find, but you can adjust the image file output to produce TIFF, JPEG, or PNG files in the “Sticher” tab in the upper right-hand portion of the Hugin screen). Below you can see the before and after of the simple panorama I created using Hugin. Four individual photos are stitched together to create a single image, with the Hugin assistant automatically attempting to adjust the images’ exposure, orientation, and cropping. If you are not pleased with your panorama, you can go back and try adjusting any of the image settings as-needed. … and panorama after using Hugin. Creating this simple panorama with the Hugin assistant took me less than five minutes from start to finish (maybe 10 minutes if you include install and picture taking time). You can also opt to by-pass the assistant, and follow these directions provided by Hugin to dig deeper into the program. The assistant feature seemed to work well with my smartphone snapshots in “ideal” photographic settings – outdoors, with plenty of natural light and subjects that are farther in the distance. More complicated projects would benefit from someone with an interest in digital photography and equipment that is much more sophisticated than a smartphone camera. Although there are more settings than I could fully explore in one sitting, I can see how the advanced features in the tool would be useful for larger projects, particularly in the hands of users with a higher level of photography experience and knowledge (or time and interest to develop such knowledge). Libraries might be interested in further exploring Hugin if they are producing images of their library to use, for instance, in promotional materials or online tours. Hugin also includes tutorials on its site that demonstrate several other techniques, including stitching multiple rows together and joining scanned images. And according to Hugin’s website, they will be unrolling a new interface sometime in 2013 (you can see a preview on the Hugin website), which promises to include Simple, Advanced, and Expert settings. Why not take a few quick shots of your library and see what you can create!